That trajectory is vividly recorded by the 150 vintage photographs in the exhibit, drawn from collections of The Jewish Museum in New York and the Columbus Museum of Art, Ohio, which together organized the show. 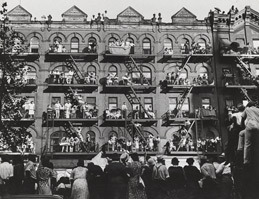 Perusing those photographs, taken by sixty Photo League members, you’ll see an Italian youth gang in Greenwich Village, Coney Island day-trippers, an African-American woman in her Sunday best, child doffers in a Tennessee cotton mill, Harlem apartment-dwellers thronging the fire escapes of a five-story building to view a parade, a child holding a sign saying “Don’t let my Daddy go to war,” the Kansas delegation to the 1948 Republican convention, a South Carolina midwife ministering to her rural clients—to list just a few of the wide-ranging subjects. You’ll also come across some of the most notable names in twentieth-century photography in the U.S.: Berenice Abbott, Consuelo Kanaga, Lisette Model, Aaron Siskind, Weegee and others. But while the Photo League attracted elite artists, it was not elitist. Functioning as a cooperative, it brought together professionals and amateurs at a time when photography was being democratized by innovations in technology and journalism. One of the most interesting objects in “The Radical Camera” is a 1941 Daily Worker article about the Photo League that explains how photojournalism was popularized in the mid-Thirties by Life and Look magazines. Seeking to broaden such satisfaction, the organization ran low-cost classes and sponsored social events such as the Crazy Camera Ball—advertised as “a new kind of costume party,” where people dressed as their favorite photograph” (“No greased nudes, please”). Uncostumed party-goers paid a quarter more ($1.75) to get in. The Photo League also ran Photo Hunts, in which participants showed up at 2 pm, went out scouring the city for the “most obscure, ridiculous and futuristic” shots, bearing in mind that “ideas count most; technic [sic] secondary”; returned at 6 and handed their film over to volunteers who processed their negatives “into supersize grandiose slides” while the aspiring photographers partied. Photos in the exhibit show Weegee, Berenice Abbot and W. Eugene Smith judging a 1947 Photo Hunt contest at 2 am. The Photo League also reached out to organized labor. “All big corporations,” observed the Daily Worker, “have developed camera clubs as company union devices, taking advantage of the enormous interest in photography. The Photo League doesn’t see why the trade unions shouldn’t develop and satisfy this intention themselves.” To that end, unionists got a 20% discount on tuition, with further reductions if five or more union members came in from the same local. Not beautiful enough, however, to protect the Photo League from the barbarity of McCarthyism. In December 1947, the U.S. Attorney General blacklisted the Photo League as “totalitarian, communist or subversive.” The League fought back, organizing a 1948 exhibit showcasing its work. But after a Photo League member and paid FBI informant named Grossman as a Communist and the League as a front organization in 1949, many members left, and in 1951 the organization disbanded. The story ends in heartbreak, but overarching theme of “The Radical Camera” is triumph, not defeat—the triumph of a democratic endeavor that aspired to the highest standards, that operated collaboratively but encouraged individual expression and aesthetic innovation, that rendered the eloquence of Americans’ common life even as it sought to change that life for the better. Go see this inspiring exhibit. And while you’re on the second floor of the Contemporary Jewish Museum, walk across the hall and check out “Black Sabbath: The Secret Musical History of Black-Jewish Relations.” We’ve all heard how Jewish songwriters and publishers on Tin Pan Alley and Broadway appropriated Black musical traditions. “Black Sabbath” explores the other half of the exchange: “how Black artists treated Jewish music as a resource for African-American identity, history and politics” from the 1930s to the 1960s. This show is aural, not visual. You sit down at one of several tables, don headphones and choose a playlist. You can hear Johnny Mathis singing the Kol Nidre, Ella Fitzgerald covering “Bei Mir Bist Du Shayn” and Cab Calloway, “probably the best known Afro-Yiddishist,” mixing hepcat jive with Yiddishisms and cantorial pyrotechnics, along with many other entertaining and, to this listener, surprising performances.